Routine surgeries like dog and cat neuters can also be performed with the laser. The minimal bleeding and post operative pain control are major reasons to perform this surgery with the laser. 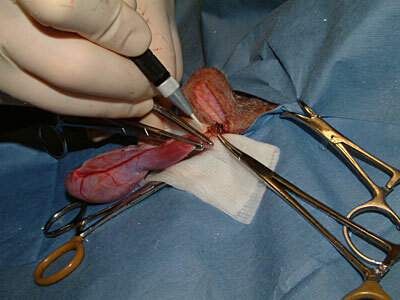 Sutures are placed around to tie off spermatic cord. Laser incision of spermatic cord allows for removal of testicle.